With a piece of paper and a Crayon, a young Madeleine Mayhew jotted down a sentence that would guide her decisions through elementary school, middle school, high school and, eventually, college. It was scrawled during a Sunday school class when a teacher asked Mayhew and other children to make a promise – in writing. Some kids promised to make their bed. Others promised to brush their teeth, or to be nice to their siblings. 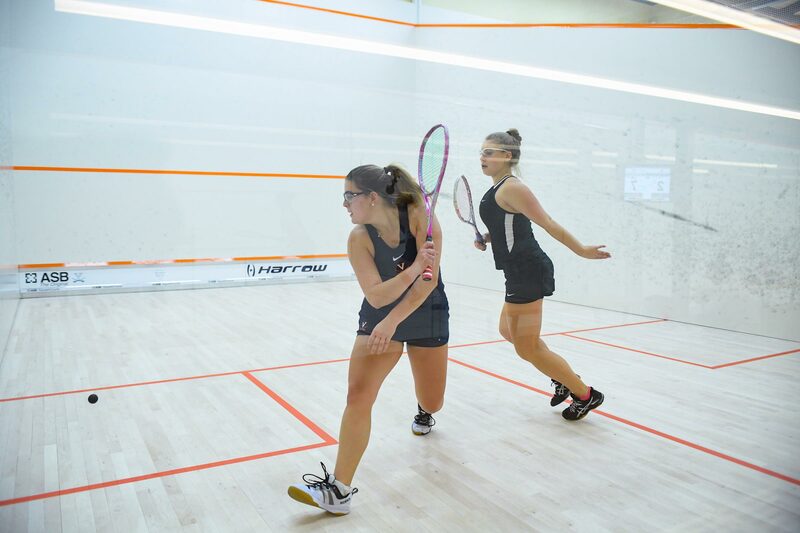 It’s what led Mayhew, a standout squash player from New York City, to the University of Virginia. Mayhew sought a college where students seemed to have a good work-life balance. A school where she wouldn’t feel bound by traditional degree requirements. And a school with a highly competitive squash program. Four years later, the Echols Scholar said she succeeded on all counts. “I think the cool thing about UVA is you really feel a sense of love of the school when you’re here,” said Mayhew, sitting near a court at UVA’s McArthur Squash Center this week. “That was something I wanted explicitly for my college experience. I wanted to feel like everyone was really happy at the school they were at. UVA head coach Mark Allen said he feels beyond fortunate that Mayhew – whom he had passed over during the recruiting process in favor of other players – came to UVA anyway. “I can truly say that had Maddie not ended up here and on this team, it would have been the single biggest mistake of my coaching career,” he said. As a co-captain this season, Mayhew helped lead the program – now in its second year as a varsity sport –to a final ranking of No. 11 in the country, up two spots from last season. Allen said Mayhew’s “infectious personality” lifted not only players’ spirits time and again, but even his own. In a match against Bates College when she was a first-year, Mayhew played through an illness (later diagnosed as mononucleosis) in leading UVA’s club team to one of its biggest wins. Mayhew, who attended Phillips Academy Andover in Massachusetts, puts the same kind of effort into her academics. As an incoming first-year, she was accepted as an Echols Scholar. It was with that in mind that Mayhew decided to pursue an ambitious academic plan. Faced with a choice between a major in the Frank Batten School of Leadership and Public Policy and the Distinguished Majors Program within the Corcoran Department of History in the College of Arts & Sciences – both of which she had been accepted into – Mayhew decided to do … both. Mayhew said double-majoring worked out perfectly. “When writing a thesis, what’s important is clarifying your research question,” Mayhew said. “If I hadn’t had some of the skills in Batten, I would not have been able to do that. While Mayhew said she can’t put a price on the things she’s learned in the classroom, her experiences outside of UVA have been just as valuable. She has had summer internships with Us Weekly, an Ariana Huffington start-up company called Thrive Global and Bloomberg Media. Mayhew said the internships have shown her what she may, and – just as importantly – may not want to pursue in the way of careers following graduation. Journalism runs in the family. Elizabeth Mayhew worked for a number of magazines – including REAL SIMPLE, House Beautiful, Southern Living and Woman’s Day – and now contributes as a lifestyle expert for NBC’s “Today” show and writes columns for the Washington Post. Elizabeth Mayhew is thrilled her daughter chose UVA. While Madeleine is hoping to work for Bloomberg after she graduates, Elizabeth Mayhew would just like everything her daughter does moving forward to trace back to that fateful sentence she wrote down in Sunday school.